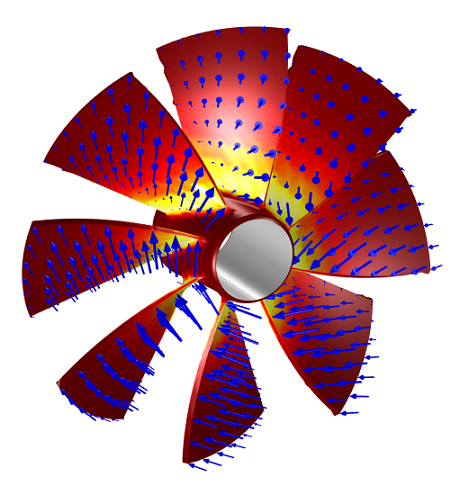 There is sometimes a need to include data from other simulation packages into a COMSOL Multiphysics model. There are a variety of ways in which this can be done, but one of the easiest approaches is to read in the point cloud data via a spreadsheet format text file. In this blog post, we walk through the steps of reading in such data, and using it in a COMSOL model. The first line you see is a header for the columnar data. We have XYZ data, and at each of these points we have the x-, y-, and z-components of a vector, which is a force that we will want to read into COMSOL Multiphysics. The remaining rows of the file are the point cloud data. Set the Data Source to File, and use the Browse button to locate the text file on your disk. The Spreadsheet data format is the default setting, and other formats are described in the documentation. Set the Number of Arguments to 3, since we are reading in XYZ data here, and toggle on the Use space coordinates as arguments check-box since the data we are reading in is a function of position. Switch the Frame drop-down menu to Material. Why? Because we are going to be applying loads to a structural problem, and by setting the Frame to Material, we specify that the loads are applied in the original, undeformed, configuration rather than the deformed, or Spatial, frame. Finally, you want to enter a Function name. Here we can use Fx, Fy, and Fz for the components of a force vector. The Position in file column specifies that these data are in the three columns after the space coordinates. 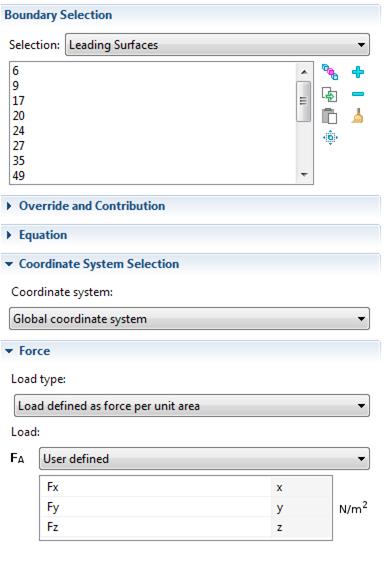 Note that COMSOL automatically detects that there are three arguments and sets the Number of arguments field to 3 automatically. Also note the Interpolation and Extrapolation settings. 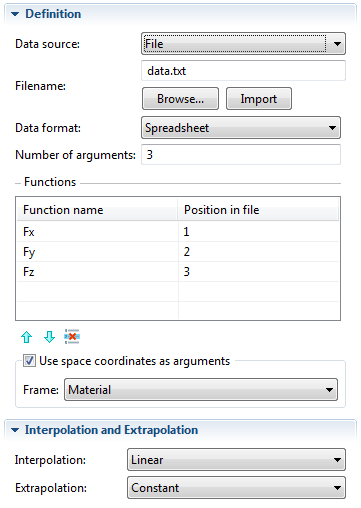 A linear interpolation method means that the spreadsheet data is mapped linearly from the source mesh points in the data file onto the destination mesh in COMSOL Multiphysics. If the COMSOL mesh lies outside of the space defined by the external data, then a constant extrapolation is used. 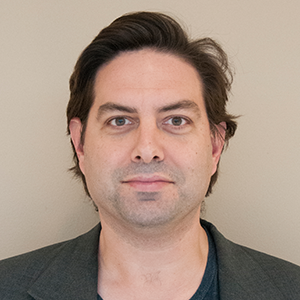 These defaults are reasonable in most cases, and more details about the mapping are given in the documentation. Wish to read in a new data file instead? You also have the option to Discard the data. 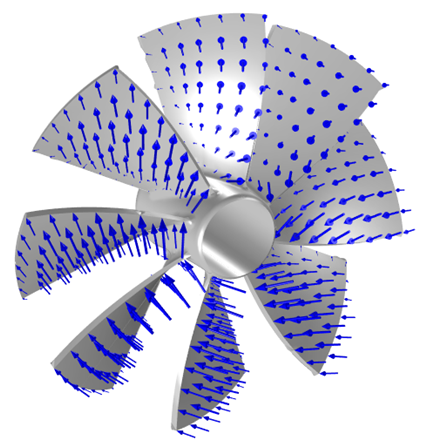 Simulating loads on an impeller. Could we create geometry from the interpolation function? for example I have created a surface (x,y,z) in the interpolation function and I want to create the same surface for my geometry. Yes, you can. You can call interpolation functions within the parametric surface geometry primitive. I have imported some permeability data from an external software into COMSOL. I tick ‘use spatial coordinates as arguments’ and ‘Geometry’ as frame. I would like to assign the material property ‘permeability’ from this dataset. When visualizing the data, they seem to not honor the XYZ coordinates. Rather, they appear stretched throughout the whole domain. Could you please indicate what the reason for this could be?